Full weekly report from Ben. The takedown is accelerating and so are the threats of a potential backlash. Stay in the Light, baby!! “The takedown is now entering a mop up phase, Pentagon sources say. “The Cabal’s last stronghold, the vast underground base at Denver airport, was routed by a contingent of US, Russian and other troops, mopping up is in progress with more raids,” the sources say. “The Khazarian stronghold of Israel is now also under unprecedented attack, as can be seen by the passing of a UN resolution condemning their illegal settlement building in the West Bank. “In an attempted counter-move, war criminal Netanyahu sent the head of Mossad to visit Donald Trump and got him to issue a statement saying he would have vetoed the anti-Israel resolution. However, with the Khazarian base in Denver being wiped out, the Khazarians no longer have the military ability to impose their will on the US government, the Pentagon sources note. “Extra security measures have been taken for Donald Trump with Russian mercenaries and special forces sent to disarm nuclear weapons in New York and near the White House, the Pentagon sources say. One nuclear weapon under Washington has already been dismantled, they add. “The Khazarians are also planning to counter attack by creating a major financial crisis, multiple sources, including from the Rothschild family, agree… The financial attack, which will accelerate rapidly in the New Year, has already begun with a major push to cause interest rates world-wide to rise to crippling levels… The planned result will be to cripple indebted emerging nations’ economies and punish debt slaves in countries like the United States… The plan is to blame the engineered economic hardship on Trump, Rothschild family sources say. However, there is a huge split within that family that will make this planned economic attack impossible to carry out. “Queen Elizabeth II, head of the committee of 300 has also been put under house arrest, Pentagon sources say… The other visible bloodline public figure being targeted by the gnostic Illuminati is Adolf Hitler’s daughter and Rothschild family member Chancellor Angela Merkel of Germany. The remaining Khazarian agents in the CIA are bracing for massive purge by Trump of the Bush faction, CIA sources say. The reformed CIA will end all drone attacks and drug flights, and will focus on human intelligence (humint), as well as open source intelligence (osint), the sources say. …a major push to cause interest rates world-wide to rise to crippling levels. This is being done by means of a huge sell off in the bond market by the Khazarian mob families. The planned result will be to cripple indebted emerging nations’ economies and punish debt slaves in countries like the United States by forcing them to pay more for their card, car, house and other loans. The plan is to blame the engineered economic hardship on Trump, Rothschild family sources say. However, there is a huge split within that family that will make this planned economic attack impossible to carry out. On that front, we got word from Nathaniel Rothschild who says he has not been killed, as claimed by Pentagon sources, but has merely gone into hiding. The source also said “The battle continues within the family. They are losing control of the world’s financial system but will still remain in the club with China at the helm, via the Shanghai gold exchange… of which they are a main player”. “It seems that those with a lot of green backs ( USD) want to get rid of it and trade it for Au. This is happening all over the world. The problem is that only a handful of people can actually move it around. Unless you are talking about black Au of which there are hundreds of thousands of tons of it but only the 10 ‘authorized dealers’ will touch it because it is not hallmarked. Hallmarked Au is not just a mark for selling, and keeping track of its movement. All hallmarks also contain a ‘radioactive marker’ so it can be tracked during shipment. Remember that the Boys also did this to the Shah of Iran’s gold stored in Thailand. Many people want the real thing now, NOT the paper that says you own it, as you and I have seen so much of that fake paper going around. That is why the next month is going to be very interesting. There is a scramble for physical gold now. The off ledger Au will be slowly moved back into the official market and must be hallmarked. We anticipate that China, Russia, and Thailand will be the main players involved in this transfer as they prepare for the new Gold backed currency. 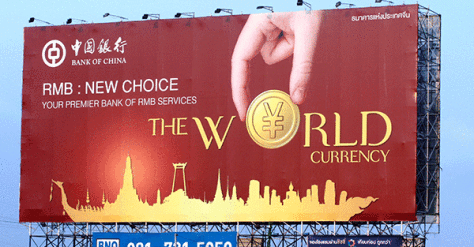 Remember that China slipped the news out in their big billboard near the Bangkok airport a few years ago. The truth was put there in place sight. Do you wonder why there is no mention of BRICS lately? It because there is internal juggling taking place. They are repositioning their strategy now. They will need the physical Au to back their currency”. Queen Elizabeth II, head of the committee of 300 has also been put under house arrest, Pentagon sources say. This can be partially confirmed by the Queen’s cancelation of her scheduled public appearances in recent days. However, sources close to the Royal Family say the Queen is simply avoiding public appearances as a security precaution because they have received reports the gnostic Illuminati are targeting her. The other visible bloodline public figure being targeted by the gnostic Illuminati is Adolf Hitler’s daughter and Rothschild family member Chancellor Angela Merkel of Germany. The Illuminati say members of the German army and intelligence services are determined to remove her from power during the coming year. The recent fake German truck terrorist attack, and subsequent media campaign pinning the blame for that on Merkel, was just the first round of that campaign they say. “The cabal are all freaked out by what they found in Antarticia – It gave Buzz a heart attack. Very large “pods” with beings inside. That is why John Kerry was there Election Day. Animals and people frozen in time. 12 – 14 foot humans in the pods who were in stasis, are now awakening”. One thing we can confirm about Antarctica is that while the North Pole appears as part of a regular map on Google Earth, the South Pole cannot be found there, instead the map just vanishes into a point where many lines converge. We can only speculate as to why that is. On a final note for this week and this year, December 25th marks the first day of the solar New Year. Since the Christians do not know the actual birth date of Jesus Christ, they conflated the old pagan solar New Year festivities with his birthday celebration. So, in a holiday spirit, we would like to wish our readers a Merry-Christmas and a Happy New Year. May 2017 be the best year yet.